• Chase Daniel continues to impress. There haven't been many negatives to report on him, and we've already pointed out a number of the positives. Daniel doesn't have much in the way of game tape to learn from, but if I were to compare Daniel in practice vs Mark Sanchez in practice, I would give a heavy edge to Daniel. Today, Daniel hit Jordan Matthews for a TD a strong throw to the back of the end zone. It's becoming clearer why the Eagles paid him the way they did. He has looked legitimately good. • This morning, Doug Pederson talked about players using the JUGS machines and tennis ball drills to improve their hands. "Really it's an individual thing that they can continue to work on," he said. "But if I don't help them in a way of -- I set JUGS machines up and tennis ball machines up after practice, where I make all the skill guys -- receivers, tight ends, DBs, running backs, [linebackers] and anybody that's going to touch the football – go over and catch off the JUGS. And it’s not just standing in front of the machine, that's the easy one. Make the tough catch and just focus on that and just do it day-in and day-out. We'll continue that through training camp. "I think you just have to continue to make a conscious effort of that. You go through a season where you're going to have drops, obviously, and there's peaks and there's valleys, and you try to minimize all that. But the more we can expose them to touches, will eliminate the drops." That was a statement I mostly ignored this morning, as every team in the NFL has guys catching footballs from the JUGS machines, including the Eagles under Chip Kelly. However, I will note that there were an abnormally high number of players working on their hands after practice today, which is a good sign. • Josh Huff was back at practice after being sent home yesterday with an illness. For the first time in (I think) all of the media-attended practices, he didn't have a drop today! Woot. In fact, he even had a nice catch on a corner route for a TD. • I still don't love what I'm seeing from Nelson Agholor. Today he caught a pass near the three-yard line and was able to stretch the ball across the goal line in quick motion. However, Jalen Mills was able to pop the ball out. I would say it was probably a completion and a TD, but you'd rather just see Agholor hold onto the football and leave no doubt. • I would say Sam Bradford has probably completed the highest percentage of passes among the quarterbacks so far this offseason. He also almost never takes shots down the field, which mirrors how he played during the regular season a year ago. Carson Wentz had a rough day. His worst moment came during a red zone drill in 7-on-7's. He locked onto a receiver, pumped once, pumped twice, and then let it rip on the third pump when the entire defense knew exactly where he was going with it. Jordan Hicks picked it off. That's Wentz's new worst throw of the offseason, eclipsing the throw he talked about in his press conference yesterday. Wentz had another throw to the back of the end zone to TE M.J. McFarland, who was well covered by Myke Tavarres. Wentz just kind of threw it up for grabs and Tavarres almost picked it off. It was a throw that needed to be in a spot where only his guy could get it, or it would be safely out the back of the end zone for an incompletion, but Wentz left it short. 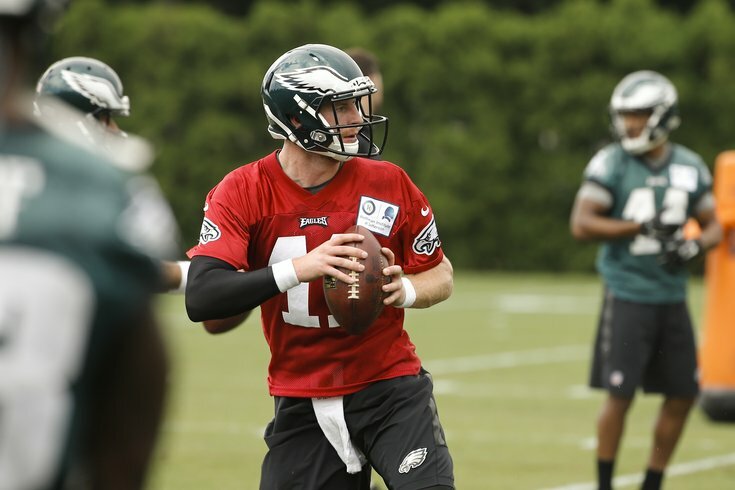 If we're going to find a positive about Wentz today, here's a cool looking shot of Wentz throwing in slow motion.